This project provides support to the biological control of chestnut blight in five Greek regions. It is anticipated that in total 2,260 ha of chestnut tree areas will be protected from this disease. 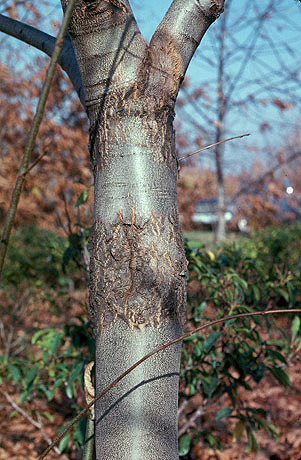 Chestnut blight (or chestnut bark disease) is caused by a fungus, which enters wounds and then grows in and under the bark eventually killing the cambium around the twig, branch or trunk. This project was conceived to preserve the forest eco-system and the livelihoods of those who depend on the productivity of the threatened forest areas in five separate Greek regions. Previously implemented biological controls for chestnut blight have had positive eradication results. The overall aim of the project is protect 2,260 ha of chestnut tree in different Greek regions. More specifically, the project aims to discover the intensity and extent of the disease in these regions. Then to introduce biological control aiming to combat the disease through the use of a Hypovirus type with double-stranded RNA, which, after attacking the fungus, turns it from a virulent into a hypovirulent. The project is expected to achieve its objectives through: i) the conduct of a study by the Forest Ecosystem Protection & Wildlife Laboratory of the National Agricultural Research Foundation to determine the intensity and extent of the infestation of Chesnut Blight in the five project regions; ii) the anointment of a biological paste on affected trees for a duration of 3 years; carried out by teams of contractors. It is expected that biological control of chestnut blight will contribute to preserving biodiversity and improving the aesthetic value of the forests. The forest ecosystem will be improved and inhabitants of the mountain regions whose living standards are related to forest productivity will benefit. Other users of natural resources such as farmers and urban inhabitants will benefit indirectly. The increase in health trees has also a positive effect in mitigating climate change. The project shows how RDP measures supporting non-productive investments offer a powerful tool to achieve 'win-win' situations where environmental objectives like preserving biodiversity or landscape value are pursued alongside economic benefits, i.e. preserving the value of standing timber. The project also provides a successful example of linking research outcomes with practical applications for nature conservation.